Appearance: Dalia is only in her optime form, so as such she is 5'7" tall, and weighs 157 lbs. The mane that drops down the back of her neck is unkept and shaggy, and is brown. 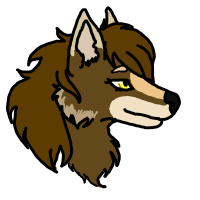 She takes more after her coyote genes overall as her fur color matches that of a coyote, but thanks to her wolf genes its thicker all around her body. Her eyes are a bright yellow that seem to pierce through the darkness of night. She generally carries her bow with a quiver which she both made by paw, and she carries both over her shoulder everywhere she goes. She generally wears the hide of her prey that she has sewn together herself in any mixed mached fashion, but most generally is just a leather top and skirt, and when it’s cold she has a thick coat made from a moose hide. She doesn’t care too much about her looks, and more with how well she can hunt so she dresses appropriately for the occasion. That being said her outfits and overall look is anything BUT formal, and while she can definitely be formal, she generally looks like the kind of person who you would be tempted to think would kill you in your sleep, but isn’t. Now wears a makeshift bandage on her left hand, and has a scar shaped like the letter "A" on that palm. Personality: She is extremely competitive about hunting, she is passionate when it comes to tailoring and sewing. She prefers her optime form heavily to any other form she uses, and she hunts with a bow. She is always on guard no matter what, and if she is surprised she will most likely attack following her natural instincts. She appreciates nature, and how the circle of life works, as well as plantlife, animals, but for the sake of the hunt. She is picky when it come to hunting partners, if she ever has the pleasure to work with one, and often will criticize how others hunt while completely overlooking her own skill in the process. She takes lots of pride with the her bow, and keeps it in top working condition at all times. She doesn’t fight fair, and in most cases she will use her claws in any sort of close combat, and if it isn’t close combat she uses her bow. A fine note for anyone who wants to introduce themselves to her, expect to be at the sharp end of her bow and arrow, or her claw if you wish to talk, because her time in the wild has turned some of her personality a bit feral due to her natural tendency to drive others away. A side note, she tends to strike first and ask questions later. Also cocky, and at times crazy or insane. Due to recent events Dalia is less competitive than normal and more passionate. She shares a fond relationship with her fox Red, and has a small crush on Aliyah. Biography: Dalia grew up a gifted huntress in every meaning of the word and phrase. Once she was able to shift she loved her optime form more than anything else in her life, and she soon took an interest in archery. She didn’t have any mentors and instead she learned by experience, and her hunting travels has taken her into the world we know now. While she honed her own skills she watched the many animals and showed respect for them even after their deaths, and she praised each after death. If you would ask her now she wouldn’t know her hometown or where she grew up, but that she was driven off for being ”Savage” in their words, but she doesn’t care. She loves traps just as much as she loves hunting and nature, and she one time recalls when she shot a moose innthe throught that had broken a snare trap of hers. She also one time caught a bear in one of her snare traps and had to flee because the trap was weak, and she wasn’t equipped well at the time. She didn’t like to recall the bear story, and her current goal in life is to hunt and kill and bring back three bears from one hunt to show off her prowess. To this day she lives carefree, but she doesn’t believe it is because she knows that every living moment could be your last. Ever since the death of Aliyah, an odd energy can be felt surrounding Dalia. Later she decides to join Mistfell Vale, after coming into contact with Malfoy, an individual who feels her pain about her own loss, and is also a member of the same pack. Wiki Profile: Click Here Extra: Current conditions include: New bow, with 8 arrows, materials for snares, cloth/hides.